If you are taking measurements to place an order please follow this guidance. If you have any questions please do not hesitate to contact us for assistance as it is most important that your measurements are correct. 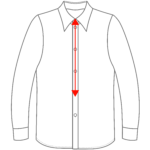 – Wearing an existing coat measure from the collar seam down the centre back seam to the bottom of the coat following the contours of the body. If for a hunting coat ensure it is sufficiently long. – The sleeve should finish at the base of your thumb ie approx halfway between your wrist bone and knuckle bones. 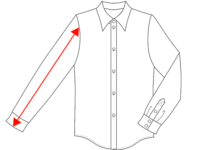 When your arms are bent forward the sleeve should then naturally shorten to finish at your wrists. – It is recommended that you err on the generous side with your sleeve length. 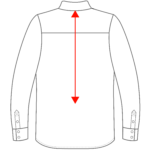 – Measure from the base of your collar in the centre back of your neck down to the waist where you want the waistcoat to finish at the back. Be aware the waistcoat will be cut much lower to the front, sloping to its points. – Measure around your stomach at the level of the bottom of the rib cage. Allow some room for breathing movement. 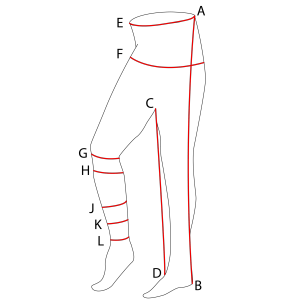 – When measuring follow ordering form measurements which will correspond to the letters shown here on the diagram. If you have any questions about measuring please feel free to contact us.